There’s nothing quite like brass when it comes to classing up your kitchen! Whether you’re trying to match other furnishings or simply looking for a stunning fixture you can use as a centerpiece for your space, the best brass kitchen faucets combine stunning looks with stellar longevity. In this guide, we’ll introduce you to the best brass kitchen faucets on the market today. We’ll explain why we chose these models over the competition, and help you choose the best one for your budget and your space! Read on to see all our current recommendations, and to find out which one you should buy! This Kohler fixture is our recommendation to anyone looking for brass on a budget. It’s affordable, has a stellar finish, and ought to last for years of use. It might not be as functional or as flawless as the Delta models below, but it’s the least we think you can pay for a truly great brass unit. It looks great. The Fairfax is bright, with a vibrant color. Most other fixtures at this price have tacky brass finishes that lack vibrancy. This one has more depth, and the shine doesn’t look cheap at all. It’s well-made. Just like the more expensive models we’ve recommended in this guide, it’s nearly all solid metal, with a ceramic valve for added longevity. While the pricier Delta models may have better fit and finish, not to mention better reliability records, the Kohler can definitely hold its own with anything else in its price range. It’s ADA-approved. This one should be easy to use for practically everybody. Compare that with a lot of other brass fixtures, which tend to be needlessly complicated or impractical. You can usually find it for well under $300. That’s certainly not cheap, but it’s a lot more affordable than the other models we recommend in this category. The escutcheon is included. Whether you’re dealing with a single-hole sink or a 3-hole sink, you’ll have everything you need right out of the box. Just like our more expensive recommendations, it’s covered by a lifetime warranty. It doesn’t offer as much clearance or flexibility as the Delta models below. It doesn’t have as good a reputation for reliability, either, though it’s certainly better than average. For a budget pick, it’s expensive. That comes with the territory, sadly. While it’s easy to find a good stainless model for under $200, you’ll easily pay $250+ for a decent brass fixture. This one doesn’t have a magnetic sprayer lock. It isn’t droopy, at least not in our experience, but it’s definitely less reassuring than the Delta models below. 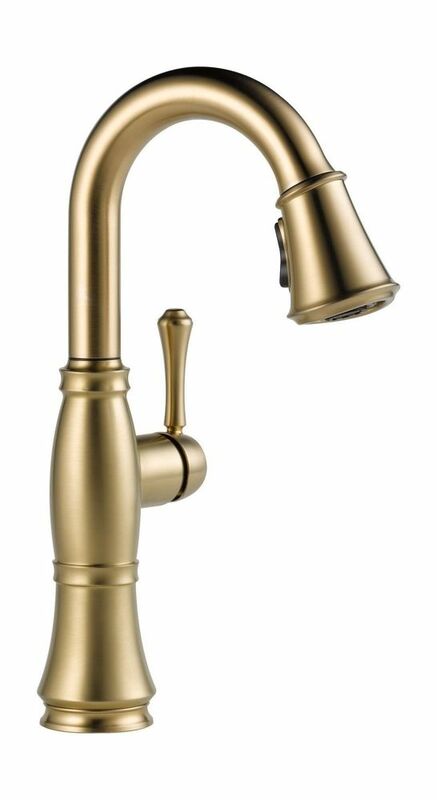 This Delta Cassidy model is our top quality pick for anyone in the market for a traditional-looking brass faucet. It’s solid, functional, and eminently classy. If you’re going for a farmhouse look or a period sensibility in your kitchen, you’ll love this thing. We think it’s the best brass option for any old-school aesthetics. The Delta Cassidy has a lot in common with the Kohler Fairfax model we’ve just looked at: solid metal construction, ceramic valve components, and an easy-clean spray face. In short, it’s a premium fixture through and through. It has a magnetic docking system on the sprayer. While the Fairfax above works very well and hasn’t sagged in our experience, magnetic setups like this are far more reassuring and tend to perform more reliably over time. It offers a lot more room to work in the sink, thanks to the high-arc spout design. This one’s much more practical than the Fairfax, without compromising on looks. The Diamond Seal construction may sound like a marketing gimmick, but we’ve found that Delta’s models which feature it do tend to last longer without leaks than comparable models from competing brands. Delta claims that this one ought to last about twice as long as the industry standard. We can’t attest to that, but we can certainly say that the Cassidy has a stellar reputation for reliability. We love the finish on this one. It’s not technically brass–Delta calls it “champagne bronze”. Having said that, it’s bright, vibrant, and decidedly richer than other brass finishes. We genuinely think it’s the best brassy finish on the market right now. As with the Fairfax above, it’s covered by a lifetime warranty. While it’s designed to work with 3-hole installations, the escutcheon is sold separately. It’s expensive. The champagne bronze finish option we’re recommending will probably run you at least $400. This is a traditional design, with lots of ornate touches and grace notes. It fits with a wide range of decor styles, but it’s decidedly not modern. Don’t get this one if you’re after a more contemporary look. The Trinsic model below is the best choice for you. This Delta Trinsic fixture is our other top quality recommendation for a brass fixture. Where the Cassidy model above is the better choice for traditional decor styles such as farmhouse or period looks, the Trinsic is ideally suited to contemporary spaces and modern decor styles. It’s all clean lines and smooth curves. It’s all-metal, aside from the ceramic valve components and the supply lines. It has a vibrant finish combining the richness of bronze with the brightness of brass. The magnetic docking system on the sprayer is as good as any we’ve reviewed. It’s covered by a lifetime warranty and has a great reputation for long-term performance. All in all, we think the Trinsic is a stellar faucet which can back up its price tag with looks, function, and quality. We love the way this one looks. It’s super clean, with design language that fits in well with practically any contemporary features. It’s definitely too sleek for farmhouse kitchens and more traditional settings. Anywhere from contemporary to modern, it’s right at home! It’s also available in a touch-on version, which may be up your alley. Touch-on fixtures aren’t quite as nifty as touch less models, but they’re also a lot more reliable and still offer some benefits over traditional fixtures. With the touch-on functionality, you can leave your temperature and flow settings in place on the control knob and simply touch anywhere to start or stop the water. Why’s that useful? There are several things we like about this setup. Firstly, it’s super convenient to be able to just tap on and off when you’re doing dishes, so you don’t have to constantly be using the knob to try and find that sweet spot again. Secondly, when you’re dealing with something like raw meat and need to wash your hands, you don’t want to be touching your control knob. Do that, and you’ll have to sanitize it afterward. It’s much easier to be able to simply tap the faucet with the back of your hand or somewhere else that’s clean. As with the Cassidy, the Trinsic will cost you a pretty penny. Having said that, at least it won’t cost much more than that model. Plan on spending about $400 for this, more if you want the touch-on version. It’s very modern, and won’t look great with older decor styles. If you’re into ornate touches and embellishments, you won’t find any here. That’s why we recommend the Trinsic for contemporary kitchens and the Cassidy for period, farmhouse, and other traditional looks. Which of these great brass faucets should you buy for your kitchen? The Kohler is the best option if you’re looking for brass on a budget. It’s simple, sturdy, and bright–everything you want from a brass fixture. However, it’s not going to work well with any kind of modern decor styles. This one’s quite traditional. It’s not as well-made as our pricier picks, either, and it doesn’t offer as much room to work. If you can afford to spend more, we think the Delta Cassidy is a better choice with a similar look. The Delta Cassidy is our top brass recommendation for those who are after a more traditional look and feel in the kitchen. Sure, it’s not technically a “brass” finish, but it’s made from nearly all brass components and the light bronze finish is brassy enough for us! The Delta Trinsic is the best brass faucet on the market right now, as far as we’re concerned. It fits well with most contemporary decor and is a real example to the rest of the market with its stellar build quality and function. Just don’t try to make it work in very traditional decor settings. We don’t suggest the touch-on version, either, unless you’re going to get at third-party warranty. Before you start looking at any specific models, you should think about how you want your new kitchen faucet to look. Are you after a more traditional silhouette with curves and ornate touches, or are you drawn more to something contemporary with clean lines? Think about what will suit the rest of your kitchen. You want to make sure your new kitchen faucet complements the other fixtures and furnishings in your space, as well as being a centerpiece of its own. In most categories, we advise buyers to know whether they need to suit a 1-hole, 2-hole, or 3-hole sink. When you’ve got more holes to work with, you have lots of options: either to use them all with independent control knobs and soap dispensers, or to choose a single-hole faucet and simply cover the rest with an escutcheon. In this category, all our recommendations are single-hole faucets. That certainly makes things simpler for you! However, it’s still important to know what you’re dealing with. If your faucet has just one hole, you can simply buy any of our recommendations and install it easily. If you’ve got more holes, you’ll need to make sure you add the matching escutcheon to your cart when you order. Don’t try and find something third-party after the fact, though, because the likelihood of finding something from another manufacturer that matches your exact finish is slim. Just get the matching component when you buy and you’ll be good as gold. Or, should we say… brass? Don’t just grab any old fixture with a brass finish option! You’ll need to be a smart shopper to find high-quality models in this category. Many super-shiny brass models are just like chrome: painted plastic that’s incredibly overpriced. All the models we’ve recommended here are either solid brass or nearly solid brass. They’re the real deal. If you aren’t drawn to any of our picks and decide to look for something else, make sure you’re careful to check whether the fixture you have in mind is made from real brass, rather than being painted plastic. You’ll thank yourself in the long run! We hope this buying guide has answered all your questions about brass kitchen faucets! Hopefully, it’s answered a few you didn’t even know you had! Make sure you click on the links in our reviews to learn more about the fixtures we’ve recommended here. That’s the best way to find complete specs, warranty details, and current prices. For more helpful buying advice, or to see even more of our recommendations for your kitchen, visit our homepage: kitchenfaucets.reviews. We’ve got you covered with everything from the best touchless faucets to the top bathroom faucets of 2019!